Alexandria Public School District’s mission is to achieve educational excellence and to inspire a life-long passion for learning. Alexandria Public School District's mission is to achieve educational excellence and to inspire a life-long passion for learning. The growing Alexandria, Minnesota school district employs 650 staff members who provide an educational environment that supports and encourages the success of their students. "The switch-over was seamless and we appreciated that there was no network downtime during the upgrade." As part of Alexandria Public Schools' ongoing commitment to creating a 21st century learning environment for their students and staff, they developed a plan to implement a Bring Your Own Device (BYOD) program throughout their district. Their students and teachers were asking for more current technology and the ability to access online learning resources that a BYOD initiative would help support. "Many other schools around us have successfully implemented a BYOD program and it is working well for them," said Kevin Brezina, Director of Technology for Alexandria Public Schools. "We felt it was a great opportunity to allow our students and staff the technology access they need to succeed." Since Alexandria Public Schools' current wireless infrastructure didn't already support a BYOD program, they relied on Marco and their vendor partner, Cisco, to help with an upgrade. Brezina and his IT staff worked with Cisco and Marco's senior systems engineers to conduct a study of their current networks to determine wireless coverage in their schools. They discovered that although the district had a good infrastructure, they did not have the wireless coverage they needed in the schools to support BYOD. Marco helped the district design and implement a wireless infrastructure for the district that included 150 wireless access points throughout their nine buildings and the ability to handle up to 2000 users. "The most important thing Marco provided was their expertise in the wireless arena," said Brezina. 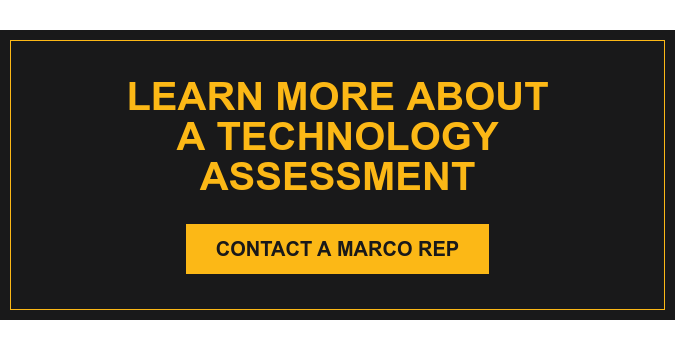 "It helped that my Marco sales reps already had knowledge of our infrastructure and experience with other schools. We felt they were looking out for our best interests while keeping our budget in mind." Marco also helped the district implement a Cisco content filtering appliance that has given students more options to safely access sites and applications they need throughout the day. In the past, the district's Internet was fairly locked down and students and teachers couldn't access the information and applications they needed. Brezina explained, "We want our students to want to use our network because they are more likely to bring their device to school and use it as a tool for learning." The appliance filters content on the Internet that users are not allowed access to, disables site features as needed, and helps designate bandwidth to handle traffic from every type of device. Brezina appreciates the "set it and forget it" structure of the appliance. The district took multiple steps to implement, approve and control usage of their new BYOD solution. After their school board approved the policy language allowing for the implementation of BYOD, parents were presented with information about the new solution. The district highly stressed that this was an option, not a requirement, and that students had to have a parental consent form signed and returned before they would be allowed to bring their devices to school. Their teachers help determine when BYOD is appropriate in their classroom. When the wireless access points went live, the district saw an increase in network traffic from 100 to 1,200 users over night. Information was launched on the district's website for staff, parents, and students to learn more about the process and benefits of their BYOD implementation plan. Brezina said, "The switch-over was seamless and we appreciated that there was no network downtime during the upgrade." Since fully rolling out BYOD, Brezina feels that it has been a very successful solution that they are continuously improving. Students are encouraged to bring in devices with external keyboards to not only consume content, but also to create content. The school district wanted the solution to be as simple as connecting to wireless in a coffee shop or at McDonalds, since many students are already familiar with that process. Teachers have been embracing the access they have to web-enabled learning software, such as Google Docs and Schoology. Because students are digital learners, the BYOD program has encouraged them to collaborate more with teachers and other students through the use of their own device. Brezina said the district is very pleased with where they are now. "We are very pleased with Marco and are going to continue to work with them," said Brezina. "They are knowledgeable and have a good local presence in our community."